In The Volcano's Mouth. Miriam Bird Greenberg. Pitt Poetry Series. University of Pittsburgh Press. Pittsburgh, Pennsylvania. 2016. It's two days in to the new year and Today's book of poetry finds himself outside of a medical clinic shortly after eight in the morning. I'm in a warm car, the engine running and I have Miles, Trane and the Cannonball keeping me company. An old friend is in the clinic doing clinic stuff. Knowing I'd be here a while, it's -25C which is why I'm keeping the car running instead of enjoying the heated waiting room in the clinic, I brought along Miriam Bird Greenberg's In the Volcano's Mouth. If I'd known what was about to happen I might not have bothered with turning on the heat. This is why Today's book of poetry got into this game. Let the banners fly and the bells ring, call out the trumpets, because Today's book of poetry is opening the year with a stunner. Miriam Bird Greenberg is a beautiful poetry monster. How else to describe the delicious havoc these poems leave in their tidy wake, how else to describe these powerhouse narratives that arrive at their harsh conclusions so gently? Greenberg totally disarms the reader with one sweep of her disarming brush and then knocks them all over with the return pass. she'd manufactured from a dollar bill. for eavesdropping on the passage of time. with her in her pack. Today's book of poetry is tickled to bring such a high-stepping collection up to bat for our first book of the year. It's too early for any "best book" of the year comparisons but we are certain In the Volcano's Mouth will be part of that discussion. This is superb poetry. Greenberg writes poems that are full of new information that feel like old knowledge, these poems feel like a modern folk tale happening in real time, stories we've known all along. It's not quite haunting but it is close to unnerving as Greenberg unleashes her formative artillery and these poems spill out in front of us like accidents that were meant to happen, prophecies we are only hearing about now. in my mechanic's jumpsuit, phone co.
ringing in an empty house. Our first morning read of the new year had to wait until the afternoon. More snow and slow minions meant for a later start than normal to our poetry world. Milo, our head tech, was all Campbell McGrath happy as Santa brought him three early McGrath titles. Kathryn, our Jr. Editor, was happy because I told her the David Lee had another book in the offing. She likes to refer to him as Sir David of Lee, and rightly so. The rest of the staff seemed to have made it through those damned reindeer and Fat Man in Red. Miriam Bird Greenberg brought everything into focus real quick. Milo was the first to say it out loud when he said "if In the Volcano's Mouth is any indication of what is ahead in 2018 we are in for one hell of a year." and made tea from the flowers. the machine had uncovered, then left behind. Miriam Bird Greenberg writes with such clarity that it breeds instant familiarity, gives instant access to the undercurrents, the swirl darkly at the edges of all these poems, she is almost tender about it. Today's book of poetry is excited to start 2018 with such an outstanding books of poems. This is Greenberg's first book but it never shows, before she is done you will want to have every word she has written. 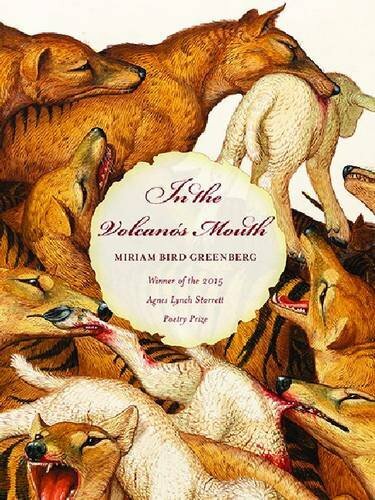 Greenberg's In the Volcano's Mouth is a book you'll want on your poetry shelf, you'll want Greenberg in your poetry brain. Today's book of poetry starts the year with a bang. Miriam Bird Greenberg's In the Volcano's Mouth will cook your poetry brain from the inside out. Miriam Bird Greenberg teaches creative writing and English as a second language. She is the author of two chapbooks, All Night in the New Country and Pact-Blood, Fevergrass. Greenberg has been honored with fellowships from the National Endowment for the Arts, the Provincetown Fine Arts Work Center, and The Poetry Foundation. Her work has appeared in Poetry, the Missouri Review, and in the anthologies Best New Poets 2014 and The Queer South. A former Wallace Stegner Fellow, she lives in the San Francisco Bay area.